Dry, cracked feet are not only unsightly, but they can be painful. The causes of cracked feet can range from dehydration to obesity, which puts excess pressure on the heels. According to the New Zealand Dermatological Society, even wearing open-backed shoes can lead to dry, cracked feet, as there is no support for the fat pad at the bottom of the foot. Whether the cause is from one or a combination of these factors, you can treat dry, cracked feet by giving them a foot soak, which helps promote circulation, adds moisture and cleanses bacteria off the skin, preventing further problems. Use a pumice stone on your cracked heels while they are still dry. This will remove any excess dead skin so that the water and salt can be more readily absorbed. Fill the foot basin with warm water. 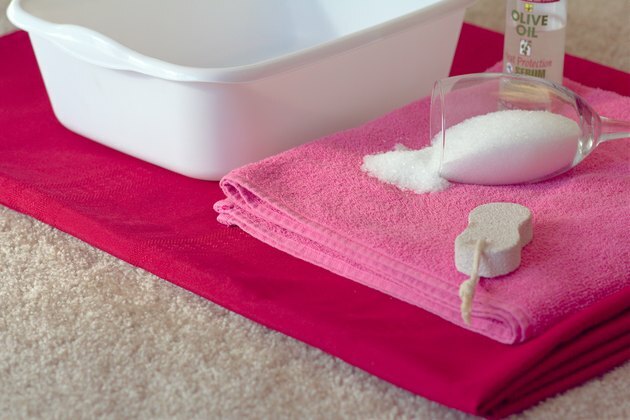 Put in enough to just cover your feet, and add 1/2 cup of Dead Sea or Epsom salt. Both types of salt help promote circulation to the feet, which, according to Awakening Skin Care in Canyon, California, will aid in healing. Soak your feet for 10 minutes, then remove them one at a time and rub the cracked areas with the pumice stone for three minutes. Put your feet back in the basin to soak for another 10 minutes. Upon removal, rub with the pumice stone once again. Dry your feet thoroughly with a towel. Apply a moisturizer such as petroleum jelly, vegetable oil or olive oil to your feet. Massage the moisturizer into the cracked areas. Put on a pair of thick cotton socks and leave on for at least an hour or overnight if possible. Repeat the foot soak once a day until you see results. If you do not see any results after one week, see your physician. Use moisturizer on your feet even after your cracked skin has healed. This will help prevent future problems. If you have any circulatory problems or diabetes, speak to your physician before soaking your feet, as some medical conditions can cause a loss of sensation in the feet.